We provide a stylish & cosy place to rest. You’ll find this special B&B nestled in the heart of East Kent - at the crown of the Elham Valley. 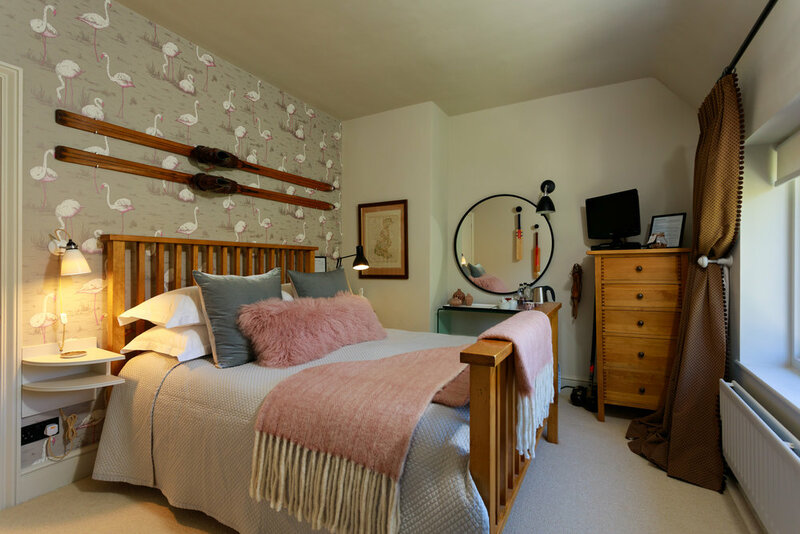 A stylish, cosy cottage bed and breakfast, offering luxurious accommodation situated in beautiful countryside and yet within easy access to the City of Canterbury (less than 5 miles), Channel Tunnel terminal, ferry ports and the coast. Beechborough is an ideal base for you to enjoy walking, cycling, sightseeing or… just relaxing! We’re perfectly placed for access to Dover (13 miles) & Eurotunnel (15 miles). Beechborough B&B offers a great base to explore the historic City of Canterbury with its breathtaking cathedral, restaurants, bars, shops & everything else that a City has to offer. Our bed & breakfast accommodation sits in an Area of Outstanding Natural Beauty (AONB), close to the historic Elham Valley railway line (now obsolete) & on the beautiful Elham Valley Way which passes right past our local pub The Mermaid Inn & close to Tadpole Tearooms & Gally's Farm Shop. We’re passionate about quality & supporting the local community. We offer good quality locally sourced ingredients for our breakfast - the pork sausages & bacon comes from happy Saddleback Pigs thanks to John based at the Lower Hardres Farm Shop. We serve local jams & chutneys made by The Wooden Spoon based in Wye & wonderful locally baked bread from Gally's Farm Shop in the village. As too is our local pub, you'll be sure of a warm welcome by Steve & Liz - they serve freshly cooked food & wonderful Shepherd Neame ale (Britain's oldest brewer). Our double rooms offer king size beds, dressed with quality Egyptian cotton bed linen. Duvets and pillows are mixed goose and duck down (fibre based available on request) - our aim is to provide a good nights rest on a quality mattress & a breakfast served with love. Each room has been refurbished to a high standard & bathrooms offer a touch of luxury that is always welcome when you are away from home. 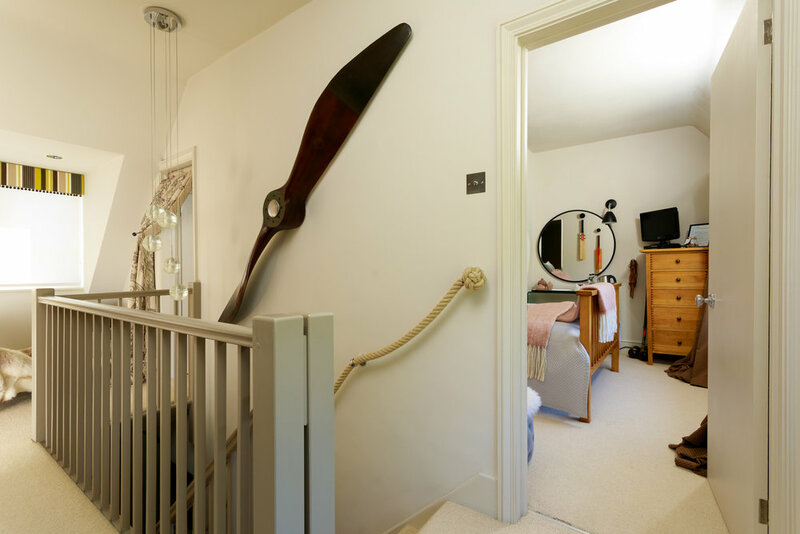 All rooms overlook the garden & The Elham Valley Way. We come highly recommended, but don’t take our word for it, read our reviews! As with all our rooms we don't skimp on the bed, being our primary room, we've splashed out on a Vi-Spring mattress which is actually the best in the house! Complete with a feather topper, mixed goose & duck down duvet & pillows, dressed with quality Egyptian cotton bed linen our aim is to provide a good nights rest, so why only stay one night? This room has a fitted bath with hand held shower (sorry, there was no room for a separate shower cubicle), modern basin sink, WC, shampoo, bubble bath, forgotten travel essentials (additional small charge), sensor night light for midnight visits and some funky wallpaper. A cosy king or twin room. Newly refurbished to provide a comfortable sleep space which can only be booked when reserving The Sports Room. With limited facilities this room shares a bathroom, so it's great for friends or family. Please note this is not suitable for children under 10 years old. It’s always reassuring to know that we’re doing the right thing... but don’t just take our word for it. Our visitors are happy to share our little secret. “Thank you so much. We had a delightful stay and a smooth journey home. It was amazing to discover such a tiny, beautiful, and secluded backwater, yet having a fine CAMRA village pub within a minute's walk, and all a mile off the A2. For historians the little village church has historic associations and stained glass from several periods, some of it inscribed in Old Dutch. The welcome was wonderful, the house exceedingly comfortable and the breakfast regal. We were bowled over by your practical helpfulness in giving directions to everything from good walking routes (with notes) to excellent eating places, secluded or lively to taste, plus first class maps to find them in minutes by car, or slowly and pleasantly on foot. 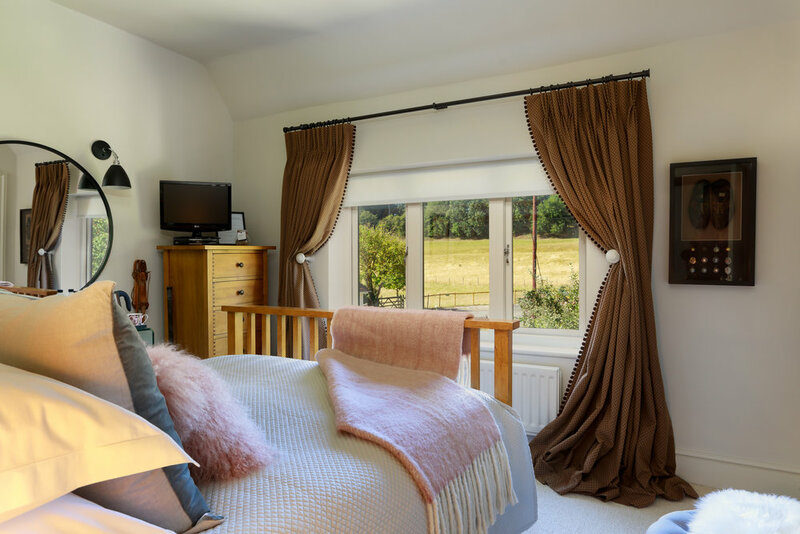 “Our 2-night stay with Lizzie and Martin was second to none in our experience of B&B, with everything living up to the descriptions on their website and also the reviews by previous guests. We felt very welcome from the moment we arrived, and very much at ease throughout our stay - this is a comfortable environment, in every respect. All rates include breakfast. Menu available by request. A pre-booked light supper or dinner can be provided at an additional cost. Please note there is a minimum 2 night stay at weekends and sorry, no children under 10, or pets, as we have our own. Please also note that there may be an additional charge for special dates ie., Christmas or Valentines etc, so please email us for rates. Arrival time 16:00 onwards, we appreciate an idea of your ETA if at all possible. Check out by 10:30. We do our best to accommodate requests outside these hours. We require valid credit/debit card details to confirm your booking & reserve the right to charge a 50% deposit. Should you wish to cancel, please give more than 7 days notice - we reserve the right to charge a minimal administration fee of £10. Cancellations made with less than 7 days notice, no-shows & curtailment of stay will be fully charged. We recommend that guests purchase the necessary travel/cancellation insurance and full Terms & Conditions can be viewed here. Please read our Terms & Conditions for further information about cancellations, arrival, departure times & other.